New Labor History marks a first return to labor and workers' history in the Russian field after a decade when most historians turned to other issues. 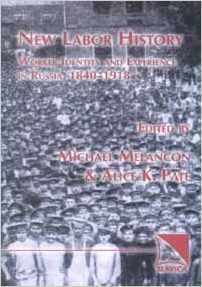 In this collection, established scholars join with younger researchers to bring new materials, innovative methods, and fresh interpretations to bear on the study of the workers' role in late tsarist and revolutionary history (1840-1918). The collection suggests the need to re-examine the experiences and aspirations of workers and, by implication, other groups in order to gain striking new insights into the pre-revolutionary era and the revolutionary process itself. The co-editors and participants hope to rekindle interest in an area of research that many have thought had exhausted its ability to intrigue, that is, to raise questions and promote hard thinking about late imperial Russia.